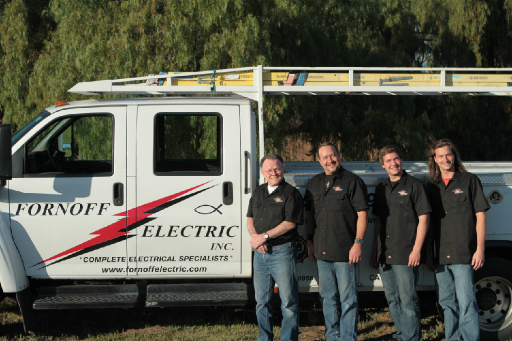 Fornoff Electric Inc. is a family tradition that runs three generations deep. We have been taking care of our communities electrician needs since 1968. We are skilled at all types of lighting design including custom installations, tenant improvements, electrical upgrades, inspections, and service work. Panel life expectancy is 30 years. Old and faulty wiring puts you, your family, and home at RISK! Fornoff Electric is an active member of a self policing network of contractors who work together to improve the industry while developing a strong relationship within our community through charitable events. Fornoff Electric is full service and skilled at all types of lighting design and specialty areas, including custom installations, tenant improvements, electrical upgrades, inspections, and service work. Commercial clients include Home Depot, Jiffy Lube, Cylex Corporation, Visible Graphics Inc., and Multi-Chem. Shed some light on your home or business with help from our commercial and residential electricians. Whether you need repairs, installations, or upgrades, we provide comprehensive electrical services. It is important to keep your electrical panel maintained regularly by a licensed, bonded and highly skilled electrician, such as Fornoff Electric Inc. Schedule an appointment today to get an electrical panel inspection. Feel the breeze indoors by allowing us to provide safe and professional ceiling fan installation. Our contractors ensure your ceiling fan is properly hung so you enjoy its long-term operation for years to come.